Dramatic tenor José Cura was both the opera’s hero Calaf and stage director. The Argentine tenor opted to do away with the typical clutter and chinoiserie that is the norm in productions of Puccini’s last work and masterpiece. Drawing on the fairy tale origin of the story, Cura sets the piece as a school project by children who design a Forbidden City using Lego, design the costumes including those of their teacher and narrator who is transformed into the Mandarin. The children sitting in the front of the stage throughout the performance also sing the children’s choruses. The conception of the work as a children’s production indeed justifies the simple sets. The adult chorus, an important element in the opera, is placed in the upper level of the imperial palace, thus affording an uncluttered centre stage. Surrounded by all female Ninja warriors, it is Turandot herself who beheads the Prince of Persia who has just failed to answer the riddles. The three riddles, the answer to which is hope, blood and Turandot herself are represented by the colours green, red and gold. At every correct answer by Calaf, a silk parchment is violently torn representing Turandot’s dread of her wedding night. 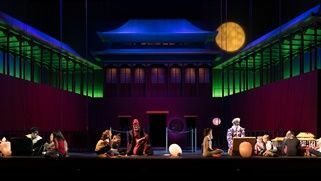 Fernand Ruiz’s evocative costumes seemed much darker than the usually colourful Turandot costumes. Likewise, Olivier Wéry’s lighting seemed too dark during most of the opera, but these choices made sense given the ending chosen by the stage director. The four leading roles were well sung. American soprano Heather Engebretson is quite diminutive and has a childlike voice, making Liù both more credible and more tragic. The voice is a tad too small, but it definitely filled the Opéra Royal de Wallonie whose capacity is about 1,000. Engebretson’s voice is agile, the timbre is pretty and the role’s quintessential legati are both beautiful and solid. Italian Tiziana Caruso was a delightful Turandot. Given the luxury of the smaller hall, finally a true Italian voice is heard in the role, a pleasure compared to the overwhelming Wagnerians. It is a luxury to hear the role sung with such a clear diction, proper emphasis and emotional subtlety. Tiziana Caruso sounded briefly brittle at the beginning of “In questa reggia”, but soon overcame this setback. She had clean and secure high notes and surprisingly for Turandot a warm voice as well. This princess exuded passion despite her icy armour. José Cura had the humility of not putting himself at the centre of the production. He even underplayed his role to allow Turandot and Liù centrality, thus emphasing the dark and clear sides of desire. Cura had the required heroic voice and had no difficulty with the high notes. Those used to lighter tenors’ recordings of “Nessun dorma”, may have expected a sweeter voice, but such is not the colour of a true dramatic tenor. Luca dall’Amico, who looked too young as the deposed Timur, regaled the public with his warm expressive bass. The three courtiers Ping, Pang and Pong sang competently but the attempt of regaining the commedia dell’arte essence of their roles failed to materialize despite their initial appearance as Pantalone, Arlecchino and il dottor Balanzone. Perhaps due to his narration in French as the teacher at the opening of the opera, Roger Joakim’s voice was not initially well placed. Paolo Arrivabeni proved an excellent conductor who managed to draw out the elaborate texture of the work. This is clearly an operatic conductor who provided all the needed support for his singers. This production opts for ending the opera with Liù’s death, omitting Alfano’s reconstruction of Puccini’s unorchestrated finale. Given the lower quality of Alfano’s music, it was not much of loss. However, this ending completely shifts the structure of the work: Liù almost supplants Turandot as the opera’s heroine. In the programme notes, Cura intertwines Liù’s suicide with that of Puccini’s maid Doria Manfredi who killed herself at the tender ago of seventeen after persistent accusations of being the composer’s new mistress by the overly jealous Mrs. Puccini. As the severely ill Puccini must have known that this would be his last work, Cura makes Timur re-enter the stage after Liù’s death as Puccini himself. The maestro then places himself on the ground to die, witnessed by the protagonists of this opera, as well as by protagonists from his other works: Tosca, Mimi, Butterfly, Pinkerton, Suor Angelica, Minnie, Manon Lescaut and others. This homage to Puccini renders the finale more solemn. It is even sadder as this production was the last time the veteran tenor José Cura will be singing Puccini. This production was graciously dedicated by Cura to the recently deceased Daniela Dessì, a frequent stage partner of his.